"I am the fire that burns against the cold, the light that brings the dawn, the horn that wakes the sleepers, the shield that guards the realms of men." 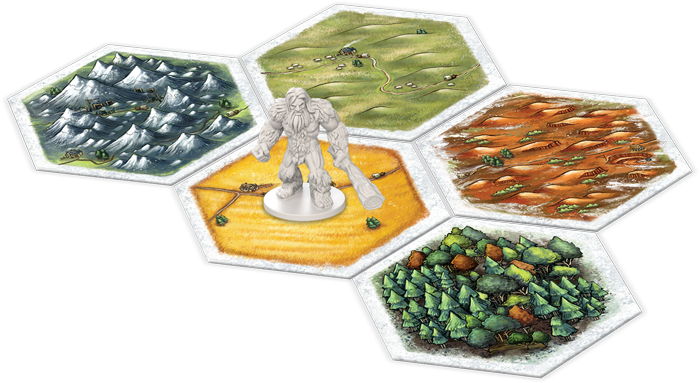 At the beginning of each turn, a player rolls two six-sided dice to determine which hexes produce lumber, brick, wool, grain, or ore. Any player with a keep or settlement connected to one of these hexes gains the indicated resources. However, as any good brother of the Watch knows, the north is a treacherous place. Wildings from beyond the Wall have their own rules of honor which do not align with the laws of lords. Tormund Giantsbane, the robber, will move throughout the Gift with every roll of "7," blocking resources and causing chaos. After resource collection, the current player may trade their resources with other players or along trade routes, if the placement of their settlements and keeps allows. 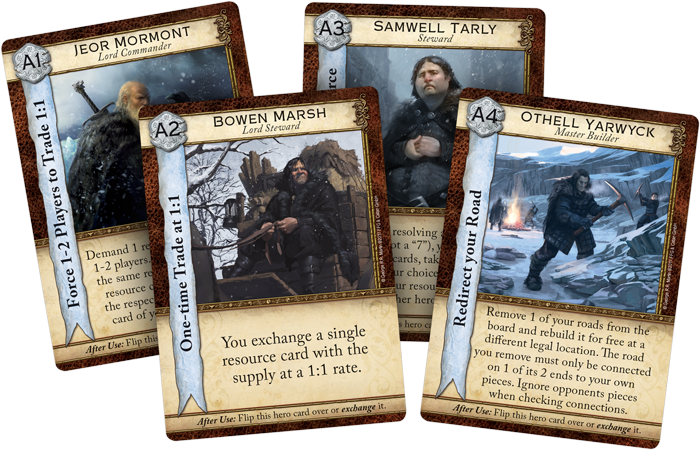 Players then use these resources to strengthen their hold on the north by building roads, settlements, and keeps; recruiting guards for their patrol; or buying Development Cards. Development Cards have a variety of effects for players to hold in their arsenal. Some are simple and act as bonus victory points, readily furthering the goal of obtaining ten victory points. Others can give players unique abilities that either benefit themselves, or betray their competition. Each of these acts, from building to buying, will help earn those important victory points and further a player's agenda of becoming the Lord Commander of the Night's Watch. Besides building within the Gift, players defend the Realm from raiders. Each player may use resources to recruit up to seven guards to man the Wall. These guards bear the color of the player who recruited them and defend that player's section of the Wall against the Wildlings who gather in the Frostfangs. 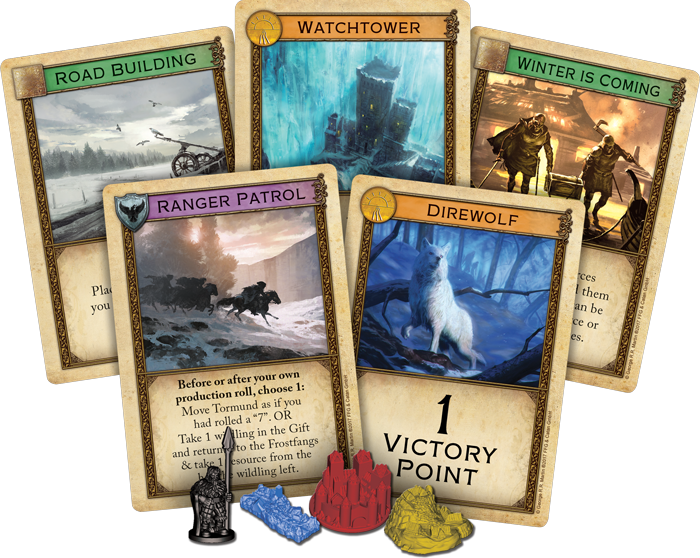 In addition to their standard guards, each player is assigned a Hero card at the beginning of the game. Player one has Othell Yarwick, player two Samwell Tarley, player three Bowen Marsh, and player four Jeor Mormont. Each Hero offers a unique ability to each player which they can use up to twice during the game. Once the hero's ability has been used, players have a choice to keep that hero or select another to aide them. There are eleven heroes to choose from. Players may factor these abilities into their strategy of how best to quickly earn victory points and win the game. 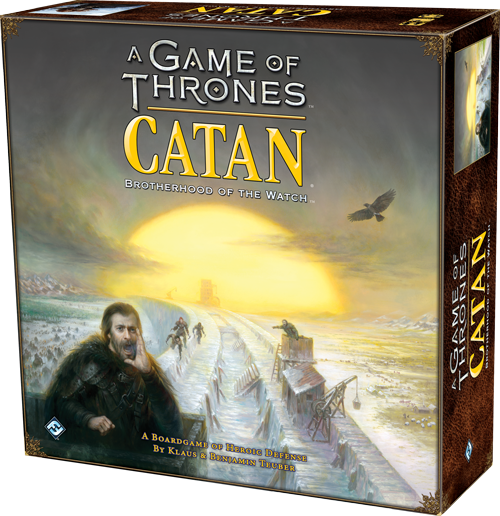 A Game of Thrones Catan: Brotherhood of the Watch expands the core game of Catan by including Wildlings and the area north of the Wall, known as the Frostfangs. This introduces a new element of gameplay to classic Catan. 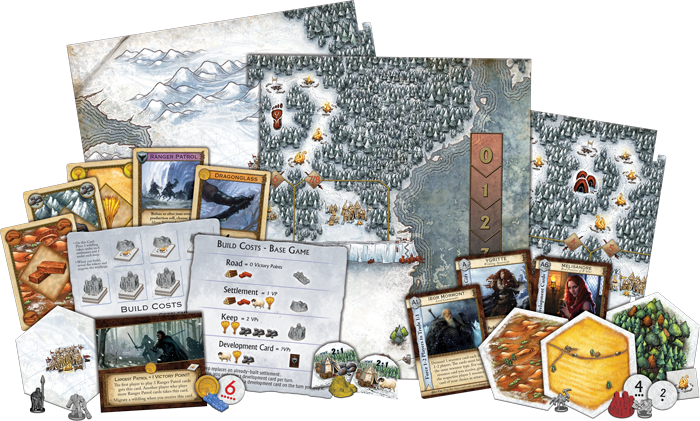 Whenever a player commits an action that would earn them victory points, such as building a keep or settlement, a facedown Wildling token belonging to one of three clans is revealed north of the Wall. Once revealed, members of the clans gather and move southward through their camps in an attempt to breach the Wall and raid the Gift. 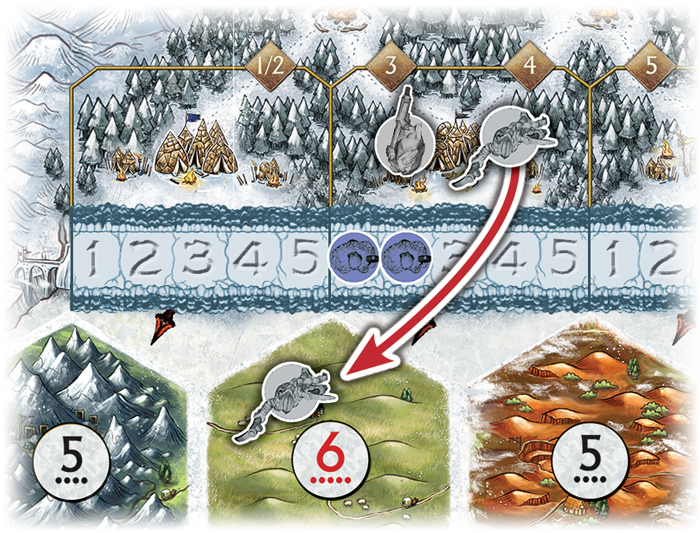 At the start of their turn, each player rolls a twelve-sided die in addition to their six-sided dice to determine which, if any, Wildlings advance toward the Wall. Upon reaching the Wall, each of three possible Wilding types behaves differently. Regular Wildlings stay in the northern clearing until they outnumber the guards on that wall section. If they grow more numerous than the patrol at any point, they breach the Wall. Conversely, Climbers can immediately cross the Wall to occupy a vacant hex directly south of the Wall. If Giants reach the Wall, they remove a guard from his post and then return to the Frostfangs themselves. However, if there is no guard on the Wall section they encounter, they breach the Wall to enter the Gift. The Climber Wildling slips past the guard to invade the Gift! If there are more guards than Wildings, the Wall stands. If there are not, the Wildings invade the Gift and pillage the players' settlements and keeps. This alternate victory occurs when the Wall has been breached three times or the number of Wildlings in the Gift reaches eight or more. If either of these tragedies happen, the game ends immediately and the player with the most guards standing wins. With Wildlings pillaging the Gift, brothers of the Watch cannot justify delaying the decision any longer. If the Watch's main struggle is properly defending the Wall, then the player who controls the most guards on the Wall is clearly the best choice for a new Lord Commander. Do you have what it takes to lead the Brotherhood of the Night's Watch? Can you balance your pride and ambition with the need for a strong presence at the Wall? Will you save Westeros or betray it? © 2017 Fantasy Flight Games & George R.R. Martin. A Game of Thrones is a TM of George R.R. Martin. Copyright © 2017 Catan GmbH and Catan Studio, LLC. Catan and the ”Catan Sun” mark are trademark properties of Catan GmbH (www.catan.com). All rights reserved.